Organizer w/removable accessory holds up to four boxes of masks or two boxes of brushes/sponges. Comes in smoky clear plastic. Built in 8.5" x 11" display window. Can be wall mounted. Gander Education program: To apply for the program, a minimum of 15 GO1s must be ordered. Once the application is approved, a 20% discount is applied to the entire order. See the above tab for more more information. Trial a GO1 Scrub Sink Organizer for 30 days. Contact us for more details. 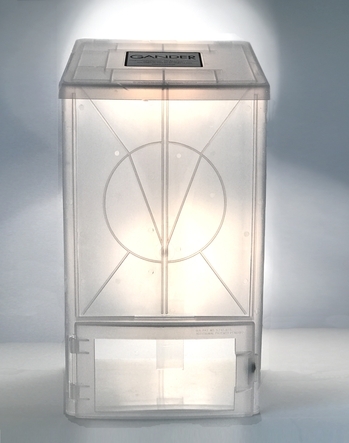 Face mask dispenser with base opening. Ideal for face masks w/o cardboard container. 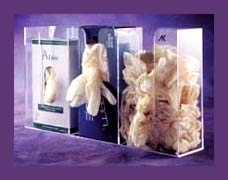 Can be wall mounted or free-standing on shelf/cart. 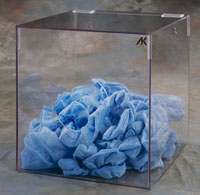 Clear plastic dispenser ideal for booties or bouffant caps. Can be wall mounted or free-standing on shelf. 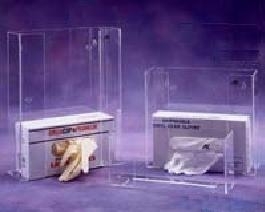 Clear plastic glove holder ideal for holding single, double or triple glove boxes Fits small-X-large gloves. Can be used to hold fluid shield masks. Can be wall mounted. 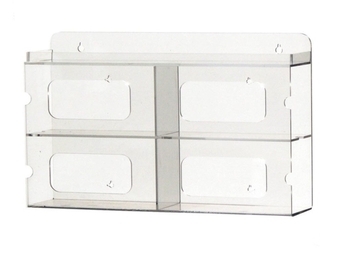 Clear plastic glove holder with individual slots for glove boxes. Fits small-X-large gloves. Can be wall mounted. 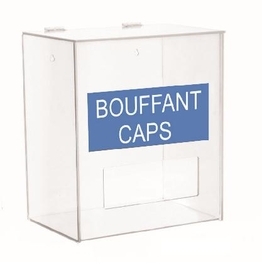 This bouffant cap holder comes with a smaller depth, ideal for tighter work spaces. Because you have asked for this! Here is a two-tier, four-pockets glove dispenser. Acrylic Mirror Accessory slides into front of Scrub Sink Organizer. Dimensions: 8.5"X11"
Velcro Adhesive. Adhere organizers to ledge/shelf of inadequate depth.